I have not seen the film which this book spawned, but I can already tell you that Michael Cera is horribly miscast in it. Nick Twisp, the protagonist of Youth in Revolt, has little of Cera's stock in trade awkwardness and none of his sweetness. Truth be told, I did not like Nick Twisp. Nor did I like The Object of His Affection, Sheeni Saunders. I kept thinking to myself, you two deserve each other. Both characters are capable of great cruelty. Sheeni manipulates every male she encounters. She is a Siren masquerading as a pseudo-intellectual fourteen year old. Prior to meeting Sheeni, Nick was a decent enough thirteen year old, ruled by his masturbatory tendencies, but loyal to his friends and somewhat sweet in his Frank Sinatra-loving geekiness. After meeting Sheeni, Nick's efforts to get together with The Woman He Loves lead to an escalating series of misadventures, which he approaches with an increasingly Machiavellian single-mindedness. He becomes not only reckless, but turns nasty - betraying friends, ruining lives and property without regard. That said, I did enjoy Youth in Revolt. The sardonically funny daily journals of Nick Twisp held my attention far more than I would have expected of a 500 page book. The lack of chapter breaks can be daunting to someone who hates to put down a book mid-chapter, but the daily journal entries, further broken into timed subsections (this kid is an obsessive journal keeper), provide the natural breaks that keep you from going insane. As a work of absurdist fiction, the nihilist tendencies within Youth in Revolt are to be somewhat expected. I can accept the reassembled Chevy in the living room, the conflagration of an entire city block, and the Mussolini Revivalist alter ego, and I admire the subtlety of Nick's creative editorial pranks. But the utter abandon with which he back-stabs friends made it difficult for me to like him. And, perhaps I am just being thick or a grammar Nazi, but I still have not figured out the purpose of the quotation marks in the book's tagline: Every "Revolution" Needs a Leader. 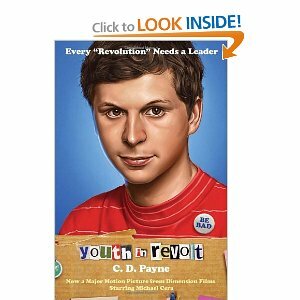 Youth in Revolt is engaging and memorable, but I am not sure I will be in any hurry to read the sequels. Not until Nick and Sheeni get smacked up the side of the head a couple of times, anyway. *sigh* I need to get back to reading more. When I was planning my "Best of" lists for this year, I had to stop and think, "Uhhh, did I read ANYTHING but magazines this year?" It's sad, really. Michael Cera was GREAT in Youth in Revolt. It was once of the funniest most overlooked films of the year. You clearly need to quit your day job in order to have more time for reading then, Beckeye. I am glad to hear that I was wrong in my assumption then, Dr M. Reading the book, I just could not see him in that role. Did you read the book? I've never been thrilled by Michael Cera. He plays the exact same character in every role. He is definitely typecast, pilgrimchick, although I have always found that character to be quite endearing. Too much Arrested Development? I do, for the most part, John. The literary world would certainly be a limited and limiting place if all characters in books were nice. But I do believe that we need at least one character with whom we can somewhat identify. I have to admit, I loved this book far more than I liked the movie. Michael Cera just kind of wrecked it for me. In fact I was quite disappointed when they plastered his mug on the soft cover reprint of the book. Glad you found enjoyment in the book. Its nice to explore out of our elements once in a while. I did enjoy the book a lot, Sean, and thank you again for the gift. I am very curious though, to know how you reacted to the personalities of Nick and Sheeni. Did you like them? Was it just me who wanted to smack them in the head? Strangely I did not like the character of Nick at all. Sheeni however I did like because she reminded me of someone I know; strange how that works sometimes. I think what appealed to me most about the book though was the whole narrative structure which was so unorthodox. I like that in literature. All in all, an adventurous read. The narrative structure was very refreshing, Sean. It cannot have been easy to maintain that style of writing for 500 pages. And it's a small point, but I love how Payne began references to Carlotta in the third person and smoothly switched, in the same sentence, to the first person. It sort of summed up nicely how Nick fully inhabited that persona, I thought. I haven't done enough reading this year either. Still attempting to finish "On The Road", for one thing. Also I adore Michael Cera just being Michael Cera. He is too sweet for words. Arrested Development movie yay! I understand The Road is really bleak, BAP. I still want to read it though. We need that Arrested Development right now!